Investigating how Australian sorghum can be used in the manufacture of the popular Asian alcoholic drink, Baijiu, is under the microscope of CSU researchers. Investigating how Australian sorghum can be used in the manufacture of the popular Asian alcoholic drink, Baijiu, is under the microscope of Charles Sturt University (CSU) researchers. The Functional Grains Centre at CSU in Wagga Wagga has secured a new, five-year Grains Research and Development Corporation (GRDC) research project. Centre Director Professor Chris Blanchard said, "The potential of sorghum, which is mainly grown in Queensland, is currently not being fully realised by Australian farmers. It is used domestically as a low value animal feed, however, there is increasing interest from Chinese customers to use Australian sorghum in Baijiu production. "We believe there are opportunities to add real export value to the grain for Australian producers by understanding the science behind Chinese Baijiu production. "To do this, we will need a deeper understanding of the size of the sorghum export market and the suitability of Australian sorghum varieties for Baijiu. "In a further bid to add value to sorghum, we will also investigate how it can be used in food products. Sorghum is already used to make the new gluten-free Weet-Bix by Sanitarium. "There is a growing demand for gluten-free food products and sorghum is ideally placed to be used in these foods due to its lack of gluten proteins and its reputation as a grain with a low glycaemic index. Sorghum also has a high level of natural phenolic compounds which have been associated with a range of health benefits. 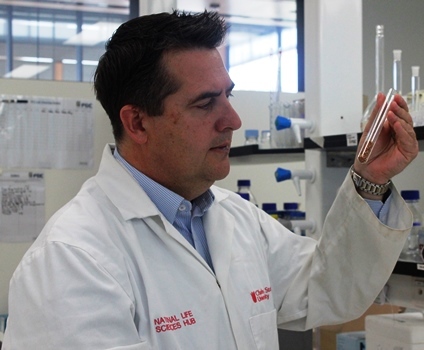 "Our aim at the Functional Grains Centre is to transform cereals, pulses and canola into high value food and beverage products. This project – focussed on sorghum – certainly fits the bill." The three-staged project, Expanding options for sorghum – food and distilling, will also draw on the expertise of other CSU staffing including: Professor of Perceptual Psychology Anthony Saliba; Professor of Food Engineering John Mawson; food science and technology researcher Dr Asgar Farahnaky; and Postdoctoral Scientist Dr Zhong Kai Zhou. The CSU team will also collaborate with the University of Sydney to develop new sorghum food products based on market research to determine what products consumers are demanding. The Functional Grains Centre is an Australian Research Council (ARC) Industrial Transformation Training Centre located at CSU in Wagga Wagga. Read more here. Professor Chris Blanchard is Director of the Functional Grains Centre at CSU in Wagga Wagga. He is a member of the Graham Centre for Agricultural Innovation – a research collaboration between CSU and NSW Department of Primary Industries. Professor Blanchard is available for interview. Contact CSU Media.